Base Hockey | Professional Use Only, No Warranty. Toe curves aren’t made widely available to the general public because they’re such a special request product. If you wanted a big toe curve you had two options; go custom or buy pro stock. Most manufacturers won’t even consider making a custom stick for you unless you order 6+ sticks at a time. Hossa, Spezza, Rafalski, and Samsonov are a few of the typical players when it comes to buying a toe curve and since they are so popular, their sticks are becoming harder and harder to come by. One player who’s really fallen under the radar in recent years is Vancouver Canuck, Peter Schaefer. He was bought out by the Boston Bruins in 2008/09 and didn’t play hockey for a year but he kept training full time and was invited to the Canucks Training Camp this season. He ended up making the big club and what’s even better news is that his pro stocks will become easier to get a hold of. So here’s the Warrior Kronik we got a hold of. In typical Peter Schaefer fashion the bottom portion of the stick is spray painted black to hide the puck better. Here’s the curve, it’s flat throughout the heel and mid-blade then it suddenly warps at the toe. This pattern is terrific for snapshots. Now we look at the profile of the blade. It’s pretty pointy at the toe end, not to the same extent as Spezza’s but it doesn’t even look legal to begin with. We hope that we’ve made you aware of another toe curve to look for the next time you’re searching for a pro stock and the usual suspect’s aren’t available. So here is our finished product, the BASE Savoy Special. A variety of custom options can be chosen when ordering your stick so we’ll run through what we chose for ours. The first thing you’ll notice is the red graphics package. These sticks come in a variety of colors or you can choose to go all black like Mike Green and Paul Gaustad’s sticks in the NHL this season. If you don’t want to choose a custom color then you’ll get the standard Red/Orange package. This is the bottom stripe of the stick, very ONE95-esque if you ask us. So the blade is what really sold me on BASE sticks. The blades feel softer and it really dampens the puck when giving and receiving passes. You don’t get any of that ‘ping” feeling like other composites I have used. On the other hand when you’re shooting the blade feels soft here as well, similar to a wood blade. I don’t feel the same ‘pop’ I would with a ONE95 or a Dolomite but this is merely a personal preference sort of thing. I’d like to compare it to a similar idea as the Easton Synergy Si-Core, but it actually works. The sandpaper texture, BASE calls it “Sharkskin,” is the default finish for the blade; naked being the other choice. I prefer the sandpaper finish because it gives your blade that extra little bit of protection, especially if you’re the type of player that doesn’t tape the entire blade. It’s similar to the Z-Tac coating Easton has been using on their blades for the longest time as well as the coarse coating you’d find on many pro stock sticks. I’ve heard of people spraying on some sort of a flooring texture (like the silica sand people sprinkle onto stairs for extra grip) on their blades to try and emulate the same effect. Most sticks you see in retail will have the much glossier “naked” finish. Just like the Pros you can get your own name on these sticks. I already have “M. NG 2” on my custom Eagle CP94 gloves so it’s only fitting that I get it on the BASE stick to match. The “75” beside the name is the flex. I believe the pattern number will be listed if you don’t want to pay the $8 for custom color and name. Ours is a BM12 (Iginla Clone) in case you’re wondering. Towards the bottom of the shaft there is an oval for your jersey number or team logo. You can send them a .jpg and they can screen it onto the stick, very cool! Mike Green, #52 of the Washington Capitals, was seen using a BASE Hockey Stick in preseason action against the Columbus Blue Jackets. BASE Sticks will be in the NHL this year sporting a blacked out look. Check out BASE at www.MyBaseHockey.com and keep your eyes and ears open to our blog as well as our Twitter page (www.Twitter.com/ProStockNation) as we will be giving away autographed BASE Hockey swag in the near future. Screenshot from Washington Capitals website taken on October 1, 2010. Photo remains property of it’s respective owner(s). We’d also like to congratulate Bonnie S. (BCBerrie) on winning our final pair of Vancouver Canucks Open Practice Tickets through our Twitter page. We hope that you and hockeyfan1992 will have a memorable experience. For all the remaining Canuck fans out there who weren’t able to get a hold of tickets, the Open Practice will be streamed live on Canucks.com. Congratulations to the winner of our first pair of Row 6 Canucks Open Practice tickets on Twitter, Ken L. (hockeyfan1992)! The next draw will be on Wednesday, September 29, 2010. Remember to follow @ProStockNation on Twitter and RT to win! We’d also like to thank our friends at BASE Hockey (www.MyBaseHockey.com) for supplying us with a few prizes for our readers and watchers. Stay tuned to our blog and on Twitter to see how you can win an Al Iafrate and Cliff Ronning signed BASE Hockey poster or hat! 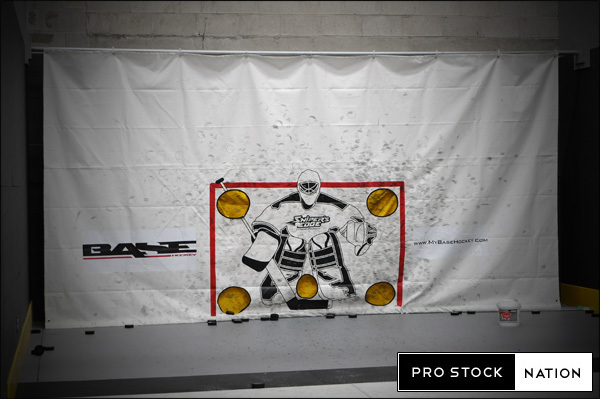 Now that your stick is ready for the cameras it’s time to go to Base Hockey’s shooting room. Inside the room is a large sheet of artificial ice so you can shoot with your skates on to exactly replicate on ice conditions. Just a heads up, the artificial ice will feel odd your first time on it. On either end of the room are tarps with the outline of a net and targets. This makes it easy for both left handed and right handed shooters to position themselves with enough room for all their shots. Prior to shooting you will be asked to rank your shots from best to worst. Snap shot, slap shot, and wrist shot. 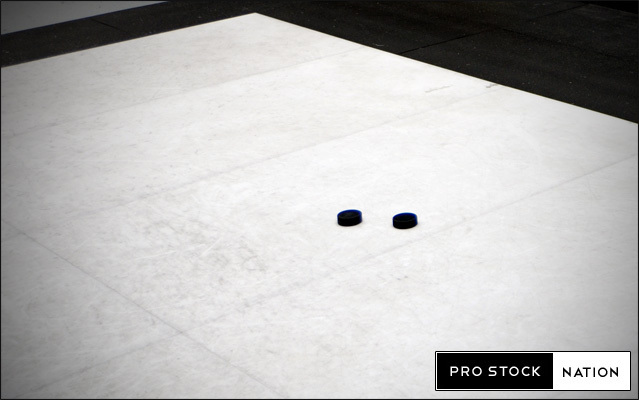 Once all the pucks are in front of you will be shown a rough spot on the ice from which to release your shots. This is to better allow the high speed cameras to capture your shot and how the stick responds. 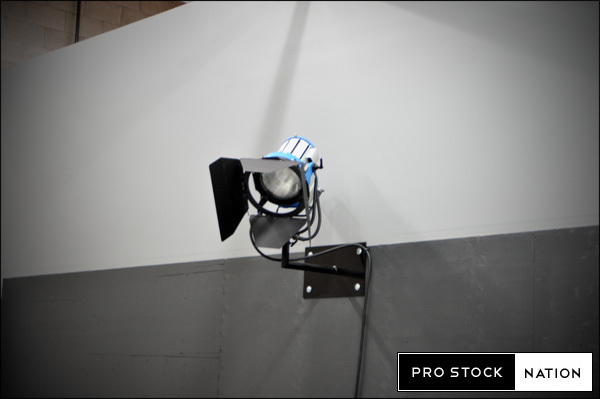 The area is well lit to allow the cameras to better isolate the puck and it’s release off the stick. Don’t trust us? These lights don’t lie. As you go through the order of your shots, from best to worst, Cliff will give you hints and pointers as to your technique and how to improve your shot. Make sure to listen, because it’s not everyday you get a lesson from a former NHLer. Throughout the process the Base crew will analyze your stick set up and offer other choices in sticks to try. 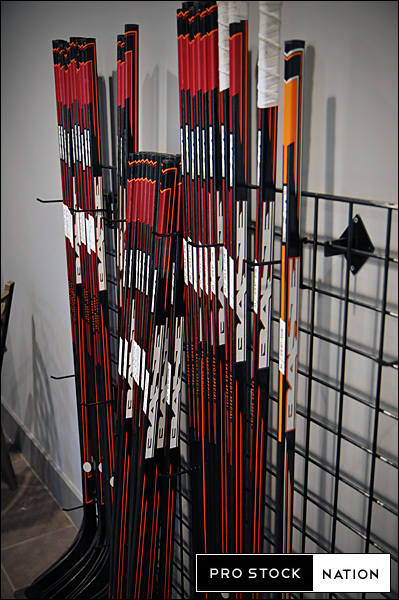 With their great selection of shafts, blades and lies you’ll definitely be able to find one to improve your game. Once you’ve gone through all of your shots and found a stick you like it’s time to go to the video room for a debriefing. While you watch slow motion footage of your shooting you will be given more in depth information about your style and how to improve. Stay tuned for more on the post shooting breakdown in part three. While we were there we got a few extra shots in for fun. Remember, no skates, no ice. Stay tuned to our blog, Twitter and Youtube pages as the kind folks at Base Hockey have supplied us with a few items to give away to our readers. You definitely don’t want to miss out! First and foremost we would like to thank Cliff Ronning and Holmes Ghassemi of Base Hockey (www.MyBaseHockey.com) for inviting us to a fitting session at their facility in Burnaby, BC. What goes on during the fitting process? 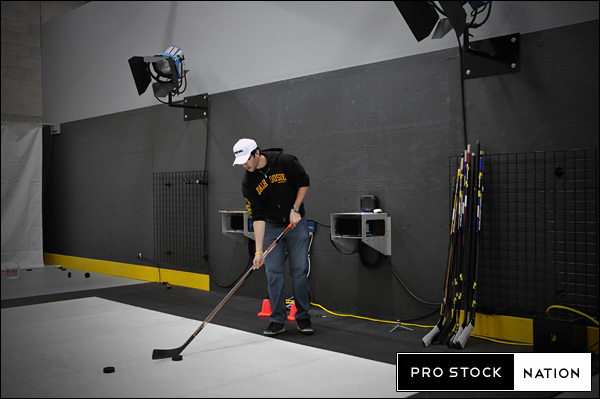 Our three part series will document what you can expect when you get fitted for a hockey stick at Base Hockey. All you need to bring is your stick, gloves and skates. Step through the two glass doors from the reception area and arrive beside the rink. From here your stick is taken to be prepped for testing. Many measurements are taken of the stick during this preparation process. The stick is clamped into a specially designed instrument to measure the true lie of the blade. The reason I say true lie is because there is no standard method of measuring the lie of a hockey stick. (Ex. A 4-lie from Brand “A” will be different than a 4-lie from Brand “B”.) Companies will either measure a blade’s lie from heel to the middle or from the heel to toe. If the lie is measured from the heel to the middle, the rocker of the blade will heavily skew the measurement of the lie. The flex of the stick will also be tested. We went to Base before they were ready to open to the public so their machine to conduct this test was not set up yet. In composite shafts, different flexes are achieved by using different weaves. Even though you’re using a stick that is labeled “100 Flex” doesn’t necessarily mean it is. No two shafts are constructed exactly the same so there are variances in the flex which can be up to 5%. So in reality the “100 Flex” you’re using can be anywhere from 95 to 105 flex. Cutting or extending the length will also have an effect on the stiffness. A few other basic measurements are made such a balance point, stick length and shaft weight. From here, six “crash test dummy-like” stickers are strategically placed on your stick. Two between your top and your bottom hand, two between your bottom hand and the blade and two on the actual blade itself. These stickers are used as reference points in order to make calculations on how much your stick flexes when they review your video footage. While your stick is being prepped, a few questions will be asked during a brief interview such as what position do you play and what your playing style is like. The next step is to get your skates and gloves on and head over to the room where the shooting (both pucks and cameras) takes place. Stay tuned for part two. In the meantime be sure to subscribe to our Youtube Channel at www.Youtube.com/ProStockNation and follow us on Twitter at www.Twitter.com/ProStockNation. Last week we visited Base Hockey Labs (www.MyBaseHockey.com) and had a great learning experience. Coming up soon is our three part series of the fitting session we received at Base. They are opening to the public soon and it’s definitely something you don’t want to miss! We are anxiously awaiting the arrival of our very own Base hockey stick. In the meantime, check out our videos from our trip at www.Youtube.com/ProStockNation. Be sure to comment and subscribe to our videos!